On the left side of the P-H chart, shown here, is the same for both types of evaporators. Please note, it is slightly different on the right side for D-X version than for flooded evaporator. From point 1, we follow the plot for any type of evaporator. Because the state of the refrigerant falls slightly to the right of saturated liquid curve, the refrigerant is a mixture of saturated liquid and vapor. You can see from P-H schema of pure liquid refrigerant was, when he resigned from the condenser in point 4. It contains 20% of couples in point 1, because what happens during the process of measuring liquid (point 4 of point 1). As the liquid passes through the dispenser quickly, this pressure surges from the condenser, the level of the evaporator. Lower pressure in the evaporator below the saturation temperature associated with it. This means that some of the heat should have been rejected from the liquid refrigerant. Not enough time measurement process, however, reject heat to the air outside the system. Instead, the heat transfer of the refrigerant itself. Some of the liquid refrigerant boils off (flashing). As you can see, the liquid refrigerant left cooler than when it left the condenser. You will notice, P-H framework, however, that this change in temperature of saturation occurs at constant enthalpy. Heat rejected still contains refrigerant is in vapor form. Sensible heat loss of fluid is accompanied by the latent heat of increase is contained in pairs. Refrigerant vapor produced through the metering process is called "flash gas". Note that 20% of flash gas at the inlet of the evaporator about normal for comfort air conditioning work. Refrigerant continues to absorb heat, and changes in pairs (gas). Now we need to move to the right on the P-H chart, note the state of the refrigerant, because of its enthalpy is growing. In the point 1 -, all the liquid has become saturated vapors. This is a good opportunity to observe the design differences between the two types of evaporators. 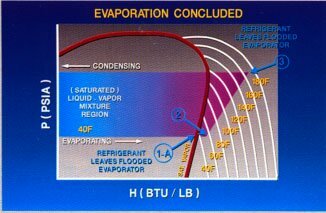 For example, in the flooded evaporator model, the refrigerant leaves the evaporator at this point. On the other hand, in D-X evaporator, the refrigerant continues to absorb heat. More latent heat possibility of transfer at the point 1-A. As more heat is absorbed by the refrigerant in the D-X evaporator, the refrigerant passes through the sensible heat profit, increase in temperature at constant pressure. This process of changing its status of saturated vapors of the curve in the superheated gas in the region on the chart. Overheating added a couple of the time it leaves the D-X evaporator shown in step 2, is usually about 10F. Overheating adds only slightly absorbent ability of the evaporator. Its main advantage is to protect the compressor from the ingress of liquid refrigerant; that is, accidental return of liquid refrigerant in the compressor. Such protection is particularly important for reciprocating compressors. Other compressor designs are less sensitive to damage from hydraulic shocks. They can use in flooded evaporators, because they do not need the protection provided by overheating process in D-X evaporator.